A lawsuit pitting poker pro Gordon Vayo against the world’s largest real-money poker platform looks to be nearing a conclusion in federal court in California. According to court filings Monday, Vayo has voluntarily dismissed his lawsuit in its entirety. 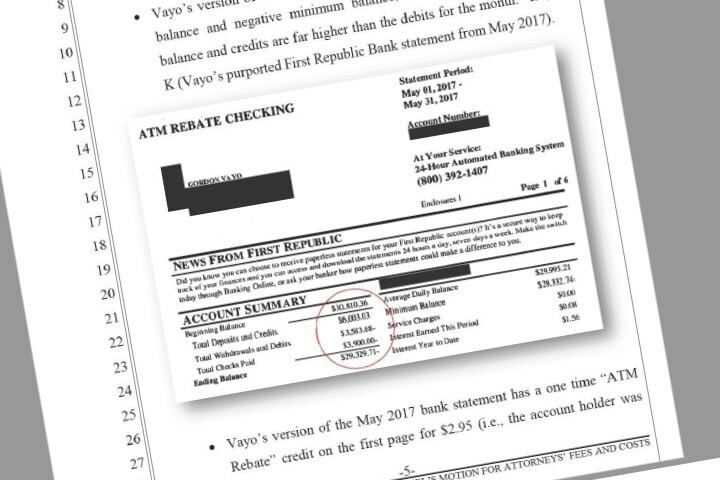 Vayo was seeking to recover nearly $700,000 in winnings from an online poker tournament in May 2017. Vayo filed his complaint in U.S. District Court for the Central District of California back in May of this year. Vayo claimed he was in Canada when he won the money, while PokerStars said it determined he was in California when playing. PokerStars isn’t legally allowed to offer games to those in the United States, with the exception of the state of New Jersey. The geolocation case was contentious, with legal counsel for Vayo calling PokerStars’ request for verifying his location a “witch hunt,” according to court filing from earlier this year. In a Nov. 12 court filing, PokerStars alleged that Vayo forged documents in his efforts to prove he was in Canada. PokerStars filed a motion seeking roughly $280,000 in attorney fees under the claims of Vayo’s alleged “bad faith conduct.” PokerStars’ is seeking to recover the costs of nearly 346 hours in legal work (about $800 an hour). PokerStars’ legal team alleged that it received a “tip” from a “third party” that Vayo had hired a “document forger” who altered his bank and internet records to help his case. A hearing in front of federal Judge Frederick Mumm is slated for Dec. 18, according to a court document. PokerStars was unavailable for immediate comment when contacted by US Bets. PokerStars’ legal team said in the court filings that the platform’s Terms of Service also provide legal grounds to recoup the costs of fighting the litigation. PokerStars previously claimed that Vayo used a Canadian mobile internet provider to “spoof a Canadian IP address.” Vayo said he used a virtual private network (VPN) to access video streaming services. The poker site claimed that Vayo has not denied the forgery allegations. “Vayo’s swift voluntary dismissal here is effectively an admission of defeat,” wrote the firm’s lawyers. US Bets was unsuccessful in reaching Vayo’s counsel for immediate comment. PokerStars left the U.S. market in 2011 following Black Friday, and it eventually settled with the federal government for about $730 million. PokerStars didn’t admit to wrongdoing. However, the Black Friday indictments forced it to exit the lucrative American market. The court battle with Vayo centered on Vayo’s physical location when gambling, something that is of utmost concern to state gaming regulators dealing with online gambling, including the rapidly growing sports betting industry in the U.S.
Agreement (also known as the Terms of Service). That agreement “governs [PokerStars’] relationship with all of its users,” according to the company. Additionally, a complete resolution to the case would be good for PokerStars considering that Vayo alleged that the poker site was turning “a blind eye to the actual physical location” of its users. In other words, Vayo was alleging that PokerStars was operating in a way that would jeopardize its New Jersey license and likely prevent it from licensure elsewhere. It’s highly unusual for such a high-profile legal dispute between a top poker pro and an online platform. Any reputational damage PokerStars might have endured as a result of the allegations in the May complaint certainily pale in comparison to the benefits of successfully defending its Terms of Service and geolocation capabilities. PokerStars was fined $25,000 in early 2017 for a software flaw in New Jersey. The New Jersey Division of Gaming Enforcement said that a “limited number of patrons” outside of the Garden State’s ring-fenced market were able to “wager” on the platform. Online gambling is still a young industry, so technical failures will happen. PokerStars isn’t the only New Jersey iGaming operator to face a geolocation fine. The internet gaming supplier GAN was hit with a $25,000 fine in 2016 for a similar issue. While geolocation is already close to 100% accurate, mistakes aren’t signs that the white market isn’t working. Black market gambling platforms offer nothing to states and customers are always at risk. Is The UFC, PokerStars Poker Partnership A Prelude For Sports Betting?